Australia has won each of its last six matches against New Zealand but there is so much more to the bare head-to-head record than meets the eye and that is why the Kiwis are worth backing to cover the spread versus the Kangaroos. Rugby league administrators tend to schedule one-off games between the southern hemisphere sides and that plays into the hands of Australia. But it is a different matter when Australia and New Zealand meet in a tournament situation, with the Kiwis producing much stronger performances when they have time to work on their combinations and, to be honest, bond as a team. Something extra special happens to this New Zealand group when they spend a prolonged period in each other’s company, such as at a Rugby League World Cup. Remember, New Zealand is the reigning world champion having defeated Australia 34-20 at Brisbane’s Suncorp Stadium five years ago. And again New Zealand proved that it really can muscle up with Australia at the business end of tournaments by winning the 2010 Rugby League Four Nations decider 16-12 at the same venue two years later. Anyone who writes off New Zealand in such massive matches is no student of history. Including the 2008 Rugby League World Cup, New Zealand has won three, lost two and drawn one of its last six tournament games versus Australia. Now one accepts that Australia has been waiting five years to enact revenge for its 20-34 loss to New Zealand and that, on balance, the Kangaroos are a bit stronger than the Kiwis. But bookmakers are wrong to favour Australia so strongly and, therefore, New Zealand in receipt of eight and a half points at odds of 1.91 with Ladbrokes is the best bet in the championship match at Old Trafford. The Rugby League World Cup draw has not done any favours to Australia, either. Australia lined up against England in the tournament opener and the Kangaroos had to work hard to post a 28-20 win over one of the hosts. But since then Australia has not needed to get out of first gear to beat Fiji 34-2, Ireland 50-0, the United States of America 62-0 and poor old Fiji again, this time 64-0. New Zealand, on the other hand, comes into the final having played its toughest qualifying game last time out when the Kiwis broke England’s heart at the death, Shaun Johnson’s late try and conversion turning what was going to be a 14-18 defeat into a 20-18 victory. It is reasonable for one to expect New Zealand to hit its straps earlier than Australia in the Rugby League World Cup final because the Kiwis are more battle hardened. Therefore, a play that one may consider is New Zealand to lead at half time, which is available at odds of 3.20 with Paddy Power. Australia may find it very difficult to go from playing at half speed versus the likes of Fiji, Ireland and the United States of America to full speed against a New Zealand side that is more than a match for its opponent in the forwards even if its backs are a notch or two below top class. Finally, having expected to see the Rugby League World Cup final total tries line set at six and a half, it makes sense to back under seven and a half tries at odds of 1.80 with 888sport. Australia’s back line has not stayed the same throughout the competition and the Kangaroos may regret taking a chance with Billy Slater, their brilliant fullback who is carrying an injury. Australia’s combinations may not be sufficiently slick to make holes in New Zealand’s defence. 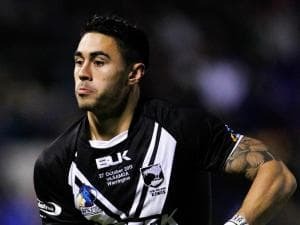 With the exception of Roger Tuivasa-Sheck, none of New Zealand’s outside backs would get a place in Australia’s squad, let alone the Kangaroos team. If New Zealand is going to remain the world champion then it is highly likely to be as a result of victory in a relatively low-scoring clash.